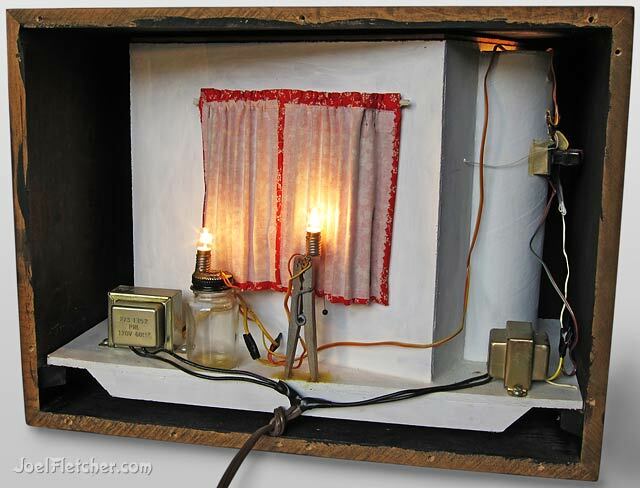 The 1/12 scale scene and electrical components are housed in a custom shadowbox. 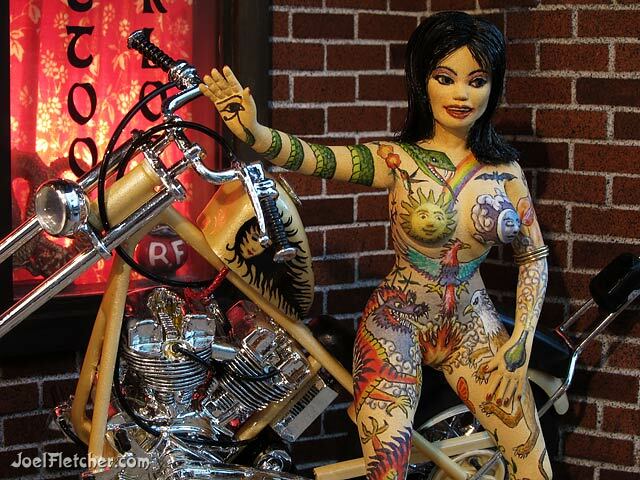 The woman's tattoos were critical to the success of this project. I researched the subject, but in those days tattoos were still considered on the fringe, and reference sources were scarce. Even so, I came to the conclusion that I did not want to imitate the typical subjects that people get tattooed on their body in a piecemeal fashion. Since I was creating an illustrated woman, I decided on a holistic approach; the entire skin of the body was my canvas and should be designed accordingly. What I came up with was an overall design based on alchemy and symbolism. Unfortunately my canvas was not a real woman, but a miniature one! Rather than sculpt the woman completely from scratch, I decided to speed up the process by using some parts from a couple Aurora figure kits to get the basic form. In Frankenstein-like fashion, I cut up and reassembled the plastic parts into the required pose. I filed away unneeded clothing, as well as body and facial contours that needed improvement. Epoxy putty was then applied and sculpted into a voluptuous figure to fit my vision. The sculpture was carefully sanded, primed, and airbrushed with lacquer paint for the overall flesh tone. I did the tattooing in oil paint with very tiny brushes, which was the most enjoyable part of the project. Hair from a doll was utilized to finish her off. The chopper was kitbashed from two Revell motorcycle model kits for a unique look. It was airbrushed in white pearl lacquer, then custom designs were hand painted on the gas tank. After the featured woman and chopper were finished, I then moved on to the storefront set which was designed around them. Plywood was used for the wall and floor framework, and 1/12 scale dollhouse components and accessories were adapted for the finish work. I hand painted a stained glass window for the door in a symbolic peacock motif. The main window was lettered with Letraset transfers, the sill decorated with tattoo related props, while curtains obscured what is beyond it. Real working lights added a sense of realism, mood, and atmosphere. The wall sconces had tiny grain of wheat bulbs, and the door and window were illuminated from behind by automotive dashboard lights. Additionally, a hidden light was installed from above to spotlight the figure and motorcycle. Since these lights had different voltage requirements, two transformers were installed in the back which converted the AC current. The shadowbox housing and the diorama were designed to integrate perfectly together. A traditional picture frame was used for the front of the box, to which I attached sides of wood, stained to match the frame. Inside, wood rails were installed to support the diorama, allowing it to be slid in and locked snugly into place against the glass in the picture frame. 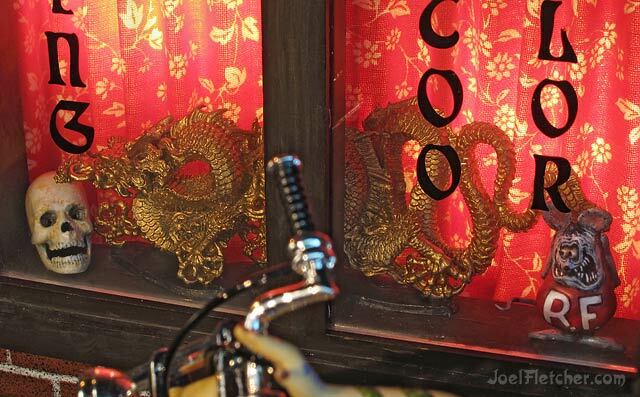 On the windowsill are a skull, a golden dragon, and the infamous Rat Fink. A look behind the curtains. Two transformers deliver power to the miniature lights. Viewed from the vantage point of its picture frame, the finished shadowbox diorama gives the illusion of an illuminated three-dimensional painting. I was very pleased with the final results of my labors, and planned to create another piece in this fascinating art form. 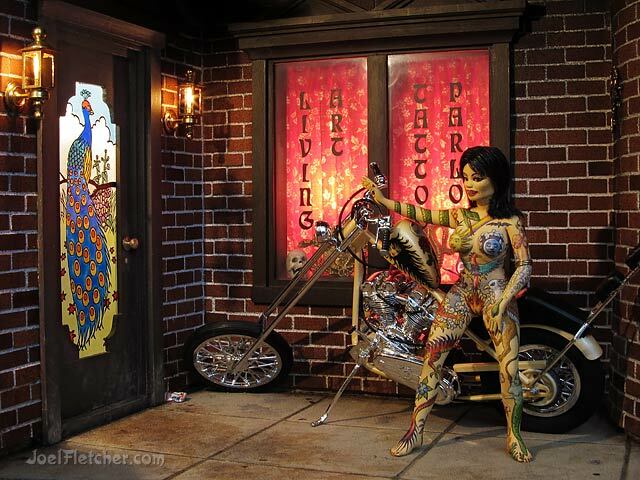 Unfortunately it never progressed beyond the planning stages, and now 27 years later my Tattoo Parlor diorama still remains the only one I made in that genre.